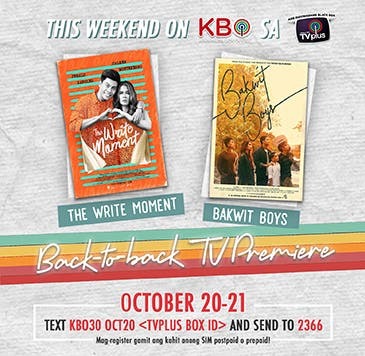 KBO brings lesson-filled stories as it features the back-to-back TV premiere of sentimental favorites “Bakwit Boys” and “The Write Moment” this Saturday (Oct. 20) and Sunday (Oct. 21). Inspired by a Pinatubo tragedy, “Bakwit Boys” tells the story of hope of four brothers. They were forced to leave their hometown when they were struck by a typhoon. As they coped with the tragedy, they also struggle to bring back the music they once love. The said film was also an entry to the latest Pista ng Pelikulang Pilipino and was starred by one of the “TNT” boys, Macki Empuerto and “Hashtags” members Ryle Santiago and Nikko Natividad. Bannered by Jerald Napoles and Valeen Montenegro, “The Write Moment” revolves around a heartbroken writer. He tries to get a second chance with his past love with his romantic comedy script but fails and instead finds himself living the script he wrote. Simply register using any prepaid or postpaid SIM. For prepaid, just load up (Globe, TM, Smart, Sun, TNT) with P30; press the green / INFO button on your TVplus box remote to get your box ID; then text KBO30 OCT20 to 2366.